Sometimes an artist is referred to as an “artist’s artist”; that is, they don’t have public name recognition, yet are respected by other artists and makers. Think Forrest Bess or Joseph Yoakum. Like trade secrets, their images are passed around in studios, their names invoked with reverence. Alexander Calder (1898-1976) was never an artist’s artist, but the Museum of Contemporary Art’s newly opened exhibition, “Alexander Calder and Contemporary Art: Form, Balance, Joy,” aims to reposition him as such. Calder is a corporate darling, as his instantly iconic steel constructions are plopped in plazas of almost every major city. At the MCA, they tell me he’s the most requested artist by the visiting public. He’s been on constant display there, in a corner gallery on a stairwell landing, at least since 2007. But Calder is so ubiquitous that he’s become invisible in the art world, so populist that he’s ignored by artists. Can you remember the last time that you paused to look at the Calder sculptures in that stairwell gallery? The current show is a refreshing re-hanging of Calder’s sculptures, but not an altogether convincing statement on his legacy as beacon of contemporary art. There are over fifty of Calder’s mobiles and stabiles in one large gallery. The metal sculptures are strikingly ethereal. These are not the hulking chunks of steel that one expects from his outdoor pieces. Fish and cats float among abstract leaf and snowflake shapes, connected by thin arcs of wire. The adjectives ‘playful’ and ‘whimsical’ are often applied to these sculptures, but I also saw much elegance and formal refinement, even prettiness. I was instantly moved to sketch these sculptures, and I urge any visitor to do the same to best sense Calder’s acuity for shape. Why Calder? Why now? In her catalogue essay, the show’s curator, Lynne Warren, makes a case for post-theory art, or art produced by artists with master’s degrees that are now rejecting the legacy of conceptualism spearheaded by Marcel Duchamp (although his sculptures are often whimsical). No advanced degree is required to enjoy Calder, and while I also see some of today’s better art forsaking the rigors of intellectualism and its attendant cynicisms and ironies, one could instead look to self-taught artists, or graphic design, or popular culture (again)—practices distanced from the institutional record—for the seeds of this new anti-academic movement. Even using Lynne Warren’s strain of logic, Calder could be replaced by any number of like-minded artists: Dubuffet, Miró, Peter Saul, Karl Wirsum, Elizabeth Murray or Louise Bourgeois to argue that it’s artists, not art pundits, who create and carry the lineage of visual art. As the MCA’s recently closed artist studio exhibition revealed, an artist’s creativity is a melting pot of influences. 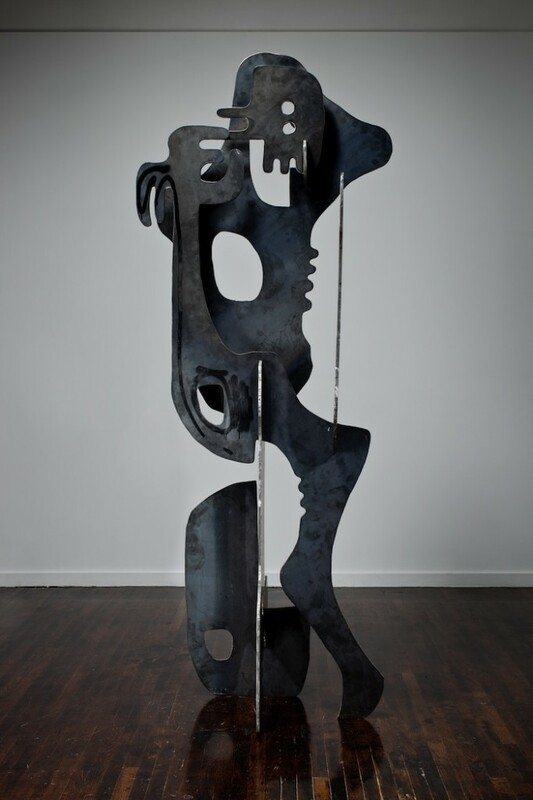 Take, for instance, Aaron Curry’s sculptures (there are four in this show), which are composed of flat metal sheets, cut into shapes, and pieced together to retain their planar appearance. This is a familiar Calder technique, but also one that Picasso experimented with in the mid-1950s, culminating with his massive Daley Plaza sphinx sculpture. Picasso’s 1955 “Centaur” is on permanent view in Los Angeles, where Curry lives, and Curry went to school in Chicago, where he surely saw the sphinx. Curry’s bony, horny totems are imaginatively grotesque, metamorphosizing figures, and I wouldn’t mention Curry without Picasso. With contemporary art, influences and confluences are rarely explicit or direct, and that’s part of the fun of discovery. Ultimately, the answer to the question “why Calder?” may be in the fine print of the museum’s collection. Several years ago the MCA accepted a long-term loan by the supportive Chicago collectors Ruth and Leonard Horwich, including sixteen Calder sculptures. Stipulated in the loan agreement is that a significant portion of the loan must be on display at the MCA, which explains the stairwell Calder show from the past few years, and may have provided impetus for prompting the current one. Furthermore, if the Horwich’s Calder sculptures have been on continuous view in Chicago’s contemporary art museum, then why haven’t any contemporary Chicago artists been selected to respond to Calder? In essence, Chicagoans had access to view Calder at the MCA whenever we felt inspired, and it seems a missed opportunity to not recognize the intended impact of the extended Calder loan. Despite this small disappointment, this exhibition is a great opportunity to view Calder in a display that finally merits attention, and also to introduce the work of seven young sculptors making their museum debut in Chicago.